The question for these four is if any of them are ready to take the next step to play in the NHL next season. George McPhee called it a long shot that any of the four make the roster, but if they are going to, the path starts now. They’d have to clearly rise above everyone else to even have a chance. Last year, Brannstrom was the most impressive, but the junior seasons of Glass, Suzuki, and Hague give hope they’ll come in and shine this week. Whitecloud has a chance to be this year’s Alex Tuch. Last year the 21-year-old Tuch looked like a man amongst boys at Development Camp and it began his path to earning a spot on the Golden Knights roster full time. As it currently stands, there does look to be a spot open for Whitecloud to slide into, but he has to be great starting this week to get it. Whitecloud won’t be the oldest player in camp, but it needs to look like he is. He should be without question the most pro-ready player at Development Camp. By the time the week is out, making sure that is clear would go a long way to McPhee penciling him into the plans to start out next season. Many of the players at Development Camp for the Golden Knights are not under Vegas’ control, Schuldt is the most intriguing of them all. Like Whitecloud was a year ago, Schuldt is one of the most coveted undrafted NCAA free agents and will be free to sign with any team when his next season at St. Cloud University is over. A Hobey Baker finalist, he’s an offensive-minded defenseman who was the captain of his team as a junior. Last year at this time he was in the Montreal Canadiens Development Camp and the Habs have reportedly been keeping their eyes on Schuldt ever since. McPhee proved a year ago that he’s willing to sign a player like Schuldt and hand him an immediate roster spot right out of college. Being invited to Vegas’ camp is a good sign the Golden Knights like the player and may consider signing him when he’s eligible. However, coming to camp doesn’t always mean you have a leg up on signing the player. Zach Whitecloud was in Kings camp last year, and we all know how that worked out. As Development Camp approaches, “when will these guys play in the NHL” is bound to become the prevailing topic du jour. However, the general manager of the team has been preaching a message of patience. Cody Glass (2017, #6 overall) and Nick Suzuki (2017, #13 overall) both recorded over 100 points in juniors a year ago. Both are likely to make the jump to the AHL in 2018. UPDATE: CHL/AHL/NHL rules do not allow Glass or Suzuki to play in the AHL next season. Both are too young. So, like this season, if either do not make the NHL roster out of camp, they will be returned to their junior team and cannot join the NHL roster until their junior season is complete. Erik Brannstrom (2017, #15 overall) played his entire season in the professional league in Sweden and was one of the final cuts on the Swedish World Championship team at the age of 19. He may be the most “pro-ready” but defenseman usually take a bit longer to make it to the NHL. Finally, Nic Hague (2017, #34 overall) was named the best defenseman in the entire CHL. This award has been previously won by Ryan Ellis, Karl Alzner, Dougie Hamilton, and Ivan Provorov. The problem for Hague is that due to his size he projects as a much more “stay-at-home” style player and his defensive skating skill is likely not ready to go against the stars of the NHL. It’s a steep climb for all four of these Golden Knights prospects to make the team and while McPhee isn’t expecting it, he’s at least open-minded to the idea. A few hours ago TSN released its annual list of the top 5o prospects in the NHL. It should come as no surprise that the Golden Knights are well represented on that list after having three picks in the top 15 in last year’s Entry Draft. Coming in ranked the highest for the Golden Knights is Cody Glass, the 6th overall pick in the draft. He’s now ranked #4 by TSN. Glass has been absolutely tearing up the WHL with the Portland Winterhawks tallying 69 points in just 45 games. Next up is the diminutive Swedish defenseman, Erik Brannstrom who was ranked #20. Brannstrom wowed at Development Camp here in Vegas before going on to win the silver medal with Team Sweden at the IIHF World Juniors. He’s currently playing in the Swedish Elite League which does not have a maximum age restriction meaning he’s playing in a league much closer to the NHL than Canadian Juniors. Therefore, his numbers (0 goals, 8 assists, 35 GP) don’t look nearly as impressive. However, the “un-forecheck-able” defenseman certainly looks like he’ll be a major piece on the Golden Knights future blue line. We’ve fawned over Brannstrom since the moment we first got to watch him take the ice at the Las Vegas Ice Center for the Golden Knights Development Camp. Then he wowed at the Summer Showcase in Detroit about a month later. This season he’s been playing in the Swedish Elite League with HV71. Training camp starts this week (!!!) with a few “informal” practices today, tomorrow, and Wednesday before the 23-man rookie roster formally begin training camp on Thursday. But as the rookies get set to hit the ice, the burning question remains for a team in a unique situation being the first expansion team in the salary cap era? Absolutely a rookie from the 2017 Draft can make the roster out of camp says Lawless. I’m here to say, the correct answer is absolutely not. The reasoning is quite simple. In the NHL when players are drafted they are signed to entry level contracts. These contracts are three years in length (assuming the player is 21 or younger), but they do not begin until the player plays more than nine NHL games in a season. So, if a player makes the team out of camp, the clock immediately starts ticking towards restricted free agency and his next, much larger, contract. In a normal situation, especially for teams ready to compete, that’s just fine because the player can help the team win. But for a team like the Golden Knights, who realistically aren’t winning much this year, the benefit of having a rookie on the roster is heavily outweighed by the option of “sliding” his contract to next year. 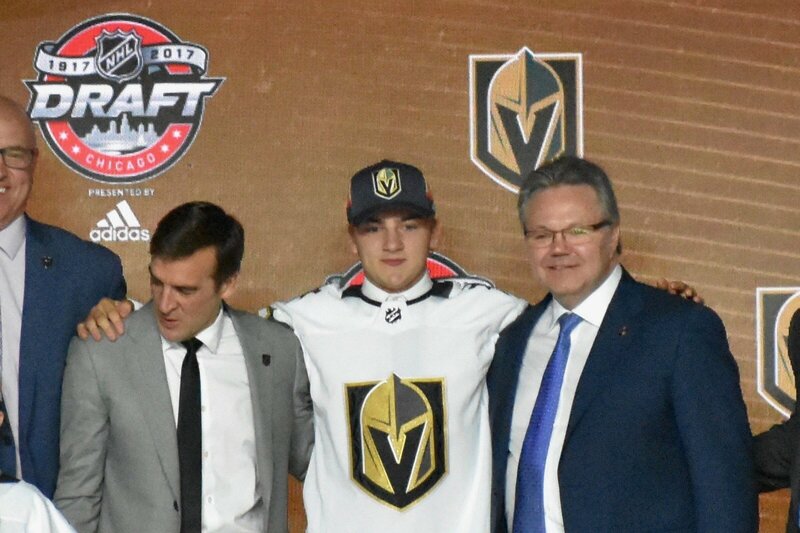 If you happened to miss last week’s World Junior Summer Showcase then you really need to start following us on Twitter missed quite the showing from one of the Golden Knights’ three first round draft picks. Luckily, we were on full Erik Brannstrom watch, and boy was it something to watch. Oh, he wasn’t done dishing. Let’s face it, we’re Brann-addicts. (Holy balls this nickname is terrible, someone please come up with something better.) We want more, we want more. What made our jaws-drop last week is seeing Brannstrom’s dominance, and then realizing he’s still developing. Which creates a major epidemic of Brannstrom withdrawal. Luckily, the 17-year-old, he’ll be 18 in less than a month, defenseman will be back in Las Vegas later this summer. After camp, who knows how long before fans get to watch the puck-moving defenseman again. When we examined George McPhee’s draft history months ago, we found he favored first-round centers over any other position. In 17 prior entry drafts, McPhee drafted eight top-round centers. His first draft with the Golden Knights was no different, he drafted two first round centers. While we wait for Cody Glass and Nick Suzuki to develop let’s look into McPhee’s first-round center success rate. McPhee’s first entry draft as Golden Knights GM shouldn’t have surprised anyone. Drafting Glass and Suzuki were conventional selections for the Vegas GM. Drafting Erik Brannstrom in the first-round was also right on par for McPhee. In Washington, three of his six defensive prospects Nick Boynton, Karl Alzner and John Carlson, became solid NHL players. Vegas fans should feel optimistic McPhee’s success rate got better, as he became more experienced. As a reminder, here’s GM McPhee’s full first round draft history. After reading scouting reports, watching highlights and attending a day of development camp, it’s time to take a shot at the best case scenario for when each Golden Knights prospect may make it to the NHL. The plan is to begin the season on the Vegas Golden Knights roster. Tuch believes he’s prepared for Vegas. Tuch is still on an entry-level contract so the organization has the power to option him to Chicago. However, team officials seem eager to get Tuch in the mix. Probably, one of the reasons the 21-year-old is in town this week. It’s going to be a numbers game come October, and because the Golden Knights have the option to send him to the AHL, that’s what may wind up happening out of necessity rather than desire or skill. But, if he’s not on this one, expect to see Tuch on opening day rosters for years to come. Most entry-level free agents don’t have the same expectations high-round prospects do. Duke is different though. As we’ve mentioned before this team signed the former Wheat King for a reason. He was clearly one of the leaders on and off the ice at Development Camp and is spectacular with the media. Duke has done an excellent job handling the pressure of being the franchise’s first player. His letter to NHL prospects on NHL.com showed the confidence and intelligence scouts raved about. Making the Golden Knights this season would be major surprise. Duke will need a year or two to develop in the AHL but the organization will give him every opportunity to succeed. He’s a clear fan favorite, but he also seems to be an organizational favorite, and a guy they would like to see make it to the NHL in Vegas, if nothing more than to prove they were right for making him the historic first Golden Knight.